For the fourth time this season, the Singapore Grand Prix will see Pirelli skip a compound. In China, Pirelli skipped the supersofts, opting to take the mediums, softs and ultrasofts, with the same three compounds being taken to Germany and Hungary. In Singapore however, while the supersoft is dropped once again, the compounds to be featured are the soft, ultrasoft and hypersoft, which will be making its third appearance of the year. One set of soft and one set of ultrasoft must be available for the race and one of them must be used at some point in the race, while the hypersoft is the assigned tyre for Q3 in qualifying. 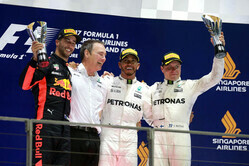 Last year's race was won by Lewis Hamilton on a one-stop strategy, starting on Inters before switching to ultrasofts when conditions improved. The top ten finishers were on a variety of strategies with some on two-stops and others, like Hamilton, on one, though tenth-placed Esteban Ocon stopped three times, starting on full wets before switching to Inters and finally two stints on ultrasofts. "I'd assign the same two compounds to every race: Hypersoft and Brutal."